A creamy and soft textured cheddar made in the West Country and coated in wax. Nestled between the Dorset Downs and the West Dorset heritage coast in Bride Valley, lies the estate from which we have sourced our Hundred Dram Cheddar. Farmhouse Cheddar has been made on the farm for over 45 years and continues the tradition of handmade West Country cheesemaking which has been handed down through the generations. The Hundred Dram Cheddar is made to a traditional recipe using milk from their neighbouring farm and a few other carefully chosen local herds. This gives the cheese a unique flavour and character that can only be found in cheese made using handcrafted methods of production. The cheesemakers are up very early every morning to begin the cheesemaking process. The curds are cut and salted by hand, the milk turning into cheese within a couple of hours. However, the maturing can then take over twelve months for the cheese to reach its optimum maturity and flavour levels. Once it is matured, the cheese is prepared to size and then coated in wax. The Hundred Dram Cheddar has a PDO status, signifying that that it is made using the milk from Westcountry herds, made using traditional methods and matured on a Westcountry farm for at least 9 months. 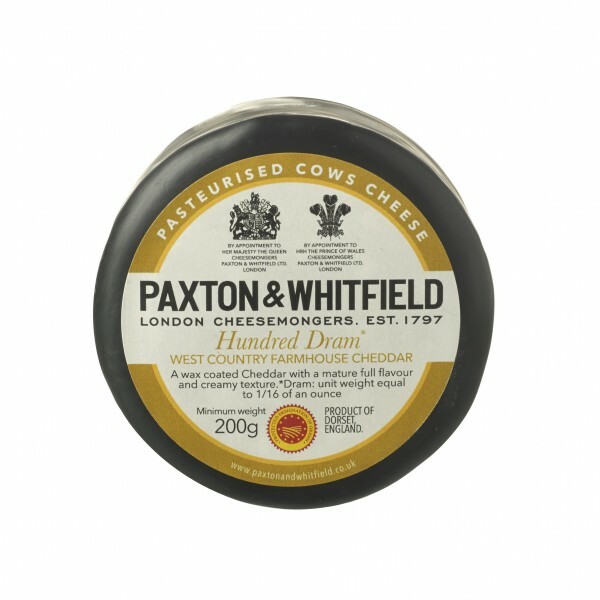 Paxton & Whitfield's Hundred Dram Cheddar is not only an ideal size, but is wrapped in an attractive protective wax coating to help extend its shelf life in the absence of oxygen.